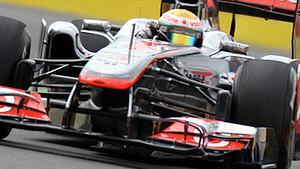 This is F1Minute - McLaren positive their pace will improve after Valencia. McLaren are heading into what could be their biggest weekend of the year, with two British drivers hoping to do well at Silverstone. With that in mind, they have been talking down their lack of form at the European Grand Prix last week, with managing director Jonathan Neale adamant they are regarding it as a blip. He said: “We underperformed at Valencia, we didn’t really get the car dialled in properly. I don’t think we delivered to our full potential there. We understand the reasons why, and we’ve done something about it.” He adds that there is uncertainty over who will be affected by the blown diffuser changes ahead of Silverstone, but believes that Red Bull still have the advantage. Meanwhile, Lewis Hamilton has been making headlines again telling the BBC that people with opinions should just keep it to themselves. With speculation still ongoing about a future move to Red Bull, former champions Jacques Villeneuve and Nigel Mansell suggested his best option would be to stay with McLaren, but it seems Hamilton is taking advice from no one.